About an hour north of Missouri’s busiest highway, another east-to-west road ambles through small towns and rolling farmland, offering you time to explore and appreciate the area’s natural beauty and some of the Show-Me State’s greatest innovators and innovations. Welcome to Missouri’s stretch of Highway 36, or, as we like to call it, “The Way of American Genius.” The nickname isn’t a boast (though we concede it might be a humble brag) so much as it is acknowledgement of the great Missourians – and their contributions to the world – who once called the area home. Mark Twain. Walt Disney. The guys who invented sliced bread. The home of the Pony Express. They all have ties to this stretch of four-lane road in northern Missouri, where the finger waved at you by fellow drivers isn’t an insult, but a friendly acknowledgement of your passing through. 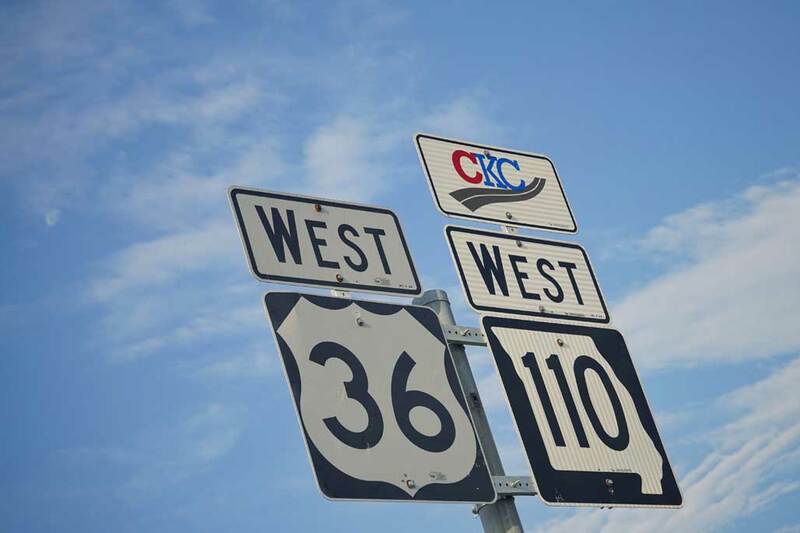 Whether your path moves from east to west or west to east, take time to get off of it and explore the entire Highway 36 corridor, which extends 36 miles to the north and 36 miles to the south of the actual highway. You’ll learn more about renowned Missouri physicians whose work improved the lives of others, military leaders whose successes are unparalleled, entrepreneurs who built retail empires, tech-savvy folks who opened lines of communication in rural areas, and so much more. While your attention may shift to the past, don’t overlook the present as you travel along The Way of American Genius. Beautiful parks, lakes, streams and conservation areas dot the landscape of the Highway 36 corridor, welcoming folks who appreciate Mother Nature and all she has to offer. Meals that make your grandma jealous are part of the experience when you travel along this route, and locally owned cafes, bakeries, wineries and breweries offer a true taste of the Show-Me State. Stick around for seconds. We tend to think it’s polite if you do. Folks who live around here enjoy life at a slower pace. And we hope our visitors do, too. Take your time, enjoy the ride and all The Way of American Genius has to offer. Prior to the establishment of the railroad in the late 1850s, the Hannibal to St. Joseph stagecoach route was called the “Hound Dog Trail.” “Missouri’s U.S. Highway 36” started out as a parallel route of the Hannibal and St. Joseph Railroad. The end point of this railroad in St. Joseph was the reason St. Joseph was selected for the eastern terminus of the Pony Express. St. Joseph and Hannibal were the second and third largest cities in the State of Missouri during this time, prior to the American Civil War. Most roads at the time were little more than improved wagon trails. In fact, many of the major “highways” were actually vestiges of old trails, such as the Oregon Trail or Santa Fe Trail. There were paved roads, but most were cobblestone and almost all were in major cities. The formal organization of the Pikes Peak Ocean to Ocean Highway Association was completed in St. Joseph in 1914 by a federation and alliance of state and interstate associations already in existence. The Lincoln Highway, from New York to San Francisco, was the first official Highway to make it all the way across the United States. The second route to cross the United States was the Pikes Peak Ocean to Ocean Highway, now known as U.S. Highway 36. The route traversed the country beginning in New York through Philadelphia and ending San Francisco. Calling itself the “Appian Way of America,” it measured 3,564 miles in length. “The Appian Way” is a reference to the most famous road of ancient Rome. Because there were no national or state departments of transportation highway organizations when many roads were paved, automobile clubs were formed and they developed and promoted their own routes. By 1925, there were more than 250 named highways, each with their own colored signs. These signs were often placed haphazardly, and with no consistency, a fact which created great confusion to the driver of the day. The United States Highway System, or simply “US” Highways, is a nationwide system of highways that was developed to enable travelers to follow standardized routes across any part of the nation. The development of the US Highway System was the first time in history that a national standard was set for roads and highways. Pikes Peak Ocean to Ocean Highway was designated as US Highway 36 in 1926 and today Missouri’s portion of US Highway 36, measures 195 miles between Hannibal and St. Joseph.